Press Release Friday, 29 Sept 2006 - The 2006 Australian International Film Festival (AIFF) is soon to hit Melbourne and is set to deliver a highly audience-accessible event, by offering a unique cinematic showcase experience in a commercial environment. Hosted at Hoyts Melbourne Central, one of Australia's most impressive cinemas, the AIFF kicks off on Saturday 21 October and will run solidly for ten days until Monday 30 October. With an overwhelming 935 submissions in both traditional and 'new media' formats, festival organisers have spent countless hours narrowing the selection to 243 official titles to create a program that provides something for everyone. Entries were received from over 30 countries worldwide with twenty percent of the final selections being Australian. "The AIFF is unique, in that it is not a traditional art-house film festival," says AIFF co-director Cameron R. Male, who is co-ordinating the event in conjunction with Tim K. Ali. "The AIFF adds another dimension to regular cinema, and the overall result is an appealing festival to suit both the discerning and conventional movie goer alike." "There are not only fantastic films on offer, but the event is extremely accessible to the wider Melbourne community." 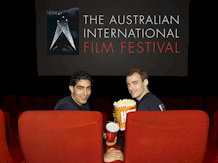 Features of the film festival include plush seats, extra leg room, digital surround sound and wall to wall screens in every one of Hoyts' 11 auditoriums. Add to this the convenience of reserved seating, a personalised booking service with friendly staff as opposed to pre-recorded messages, plus discount parking for all attendees, and it is certainly clear that the AIFF is offering a unique film festival experience. "Not to be underestimated is the benefit of having the entire festival held in the one venue," Male said. "It's a convenient central city location with ample parking on-site, and it's these little things that will contribute to a pleasant festival experience for all." Founders of the festival Cameron R. Male and Tim K. Ali, are themselves filmmakers and understand the commercial film industry, along with the various new media avenues that filmmakers are exploring. The duo has employed various strategies to ensure the AIFF not only provides maximum entertainment and an enjoyable social experience, but that it is a significant launching pad for actors, filmmakers, producers and others in the film industry. "The AIFF aims to alter traditional perceptions of film festivals and bridge the gap between the alternative film scene and the mainstream cinema experience," Male said. "The Australian film industry has grown from strength to strength and as a result, has created a gap in the market to allow for a festival such at this one." "By bringing the AIFF to the public we aim to get more Australians passionate about cinema, Australian films in particular, and contribute to the much needed growth of the Australian film industry." Along with the traditional feature and short films, the AIFF has taken submissions in a New Media category which includes awards for Mobile Phone Short Film, Memory-Chip Submitted Short Film, Video Blog (Vblog) Short Film and many more. To assist festival goers in choosing a film from the impressive selection on offer, an internet preview for each feature length title will be available on the official website www.aiff.com.au. Supporting the AIFF are its many partners including Hoyts, The Herald Sun, Mix 101.1, MySpace.com, Getty Images; Melbourne Central plays an integral role as host for the event. AIFF tickets will be available early October with screenings running Saturday 21 October to Monday 30 October.